Between January 1, 2017 and January 10, 2018, Graco 110225 ball valves were not manufactured correctly by Graco’s supplier! The incorrect valves do not have a vent hole, and as a result will not vent pressure when turned to the closed position. Air pressure can then become trapped downstream of the valve potentially causing serious injury due to unexpected movement of equipment. Your safety is Graco’s and our highest priority. All incorrect valves in inventory and in use must be removed, quarantined and replaced. The correct valve has a vent hole and is marked with a directional arrow and the number 250. 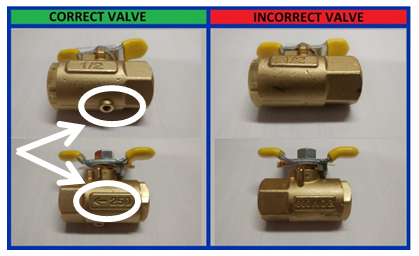 The incorrect valve does not have a vent hole and the markings are different. UPDATE as of 2/8/2018 – Graco WILL reimburse for labor on a case by case basis! We apologize for any inconvenience this may cause. If you have any further questions or require assistance, please call us at 1.800.451.4021.